Lee Johnston held on to deny Alastair Seeley a record-breaking 16th North West win by clinching victory in the Superstock race on Saturday. 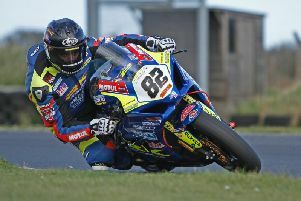 Johnston dug deep to hold off the challenge of Seeley and Ian Hutchinson. The Fermanagh rider held his nerve on the final corners to pip Seeley and Hutchinson, who had both put him under pressure throughout the race. Michael Dunlop finished fourth ahead of his brother William.